Alright, let’s get this out of the way up front so I can take full responsibility for this chronological nightmare. This record is being reviewed as a July 1948 release when in fact it came out on TWO different labels back in January 1948. But that’s only the start of the confusing twisted tale of this record and the myriad of labels involved with it, so let’s try and make some sense out of all of this since if you can follow along with the thoroughly convoluted set of circumstances that led to this mess you’ll find we at least DO have a fairly legitimate reason to review it here anyway rather than considering it a total mistake. Though both months start with the letter J, they are otherwise quite different. The average temperature for Detroit (where Todd Rhodes was from) in January is usually somewhere in the 20’s (Fahrenheit that is) while in July it’s closer to 80 degrees. In a typical year about a foot of snow falls in Detroit during the month of January while on the other end of the spectrum as far as I know they’re still waiting for the first snow flake to fall from the sky in July. In rock ‘n’ roll the difference between January 1948 and July 1948 was almost as severe. The records we’ve seen over that time have assured this, even though many, if not most, were cut in the same period as this side from Todd Rhodes. But here’s where it gets dicey. Rhodes was recording for a label called Sensation. The small Detroit company had only just started in 1947 and had extremely limited distribution covering only its home state of Michigan as well as northwest Ohio, which borders on Michigan. In other words, the other 46 states at the time had no exposure to their releases meaning their chance to actually secure a hit, make themselves some money and make their artists into stars was virtually nil. So they made a distribution deal with the Vitacoustic label from Chicago, which itself had only just started in the spring of 1947 but was backed by the Universal Recording company giving them a larger network to use. Though Vitacoustic would last barely a year in business they got one huge hit during that time (Peg-O-My Heart by The Harmonicats) and they spent money freely (which turned out to be their downfall ironically), assuring their releases would at least be noticed. 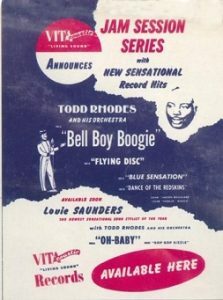 The first record of Todd Rhodes that Vitacoustic distributed nationally happened to be Rhodes debut on Sensation from August 1947, a good song called Bell Boy Boogie, which they re-issued in November as the first release in their own race line. They quickly followed it up with his Dance Of The Red Skins. This makes perfect sense because those were the first songs (and their respective B-sides) that Rhodes cut for Sensation in July, 1947, so it’s all following a pretty predictable path so far. Meanwhile Rhodes had just cut his follow-up session in October, from which emerged the song that introduced him to us, the great Blues For The Red Boy, released first on Sensation 6 in November at the same time Vitacoustic was re-releasing those earlier sides. Again, nothing surprising about this either. Labels often released material locally before issuing them nationally and this was true even more at the time for distribution set-ups such as the one with Vitacoustic (though they never got around to re-issuing that one themselves). But here’s where it gets complicated. Sensation would soon put out Rhodes’s next release Toddlin’ Boogie – the record we’re interested in now – in January 1948 on Sensation 4… and as anyone with a kindergarten education surely knows 4 comes BEFORE 6, which was already used for Blues For The Red Boy! So when initially studying the release numbers it seemed obvious – I hope, because this is my excuse for missing it back when we were covering January – that Toddlin’ Boogie must’ve come out before Red Boy. Except it didn’t. It came out after and this is pretty well confirmed by researchers who’ve studied these labels in much greater depth than I have here. So now the capper to all this, and the reason why we can fairly comfortably slot this in July 1948 after all is because while Vitacoustic DID distribute Toddlin’ Boogie themselves in January at the same time as Sensation release (giving Sensation the Michigan and Ohio areas while they took the rest of the country) that’s the precise moment when the Vitacoustic label fell into disarray. The company filed for reorganization in February 1948, thereby ending their distribution deal with Sensation whose records now were again limited to a two-state region and thus you’d think that’d end this story altogether. Yet one of those states their label reached was Ohio where of course King Records was located. When the powers that be at King heard the Rhodes sides coming out they were suitably impressed and since Syd Nathan was already starting to expand his operations to include distributing other record labels it made sense to go after this recently orphaned small label, if only to get their hooks into an artist like Todd Rhodes. It took a few months but in June 1948 the two companies made a deal in which King would distribute Sensation’s line nationally. Thus King went back and re-released all of Rhodes output to date all at once in July, including some sides Vitacoustic hadn’t bothered putting out. When one of those songs, Blues For The Red Boy quickly became a huge hit Rhodes career as a rocker took off and thereby rewarded the folks at King for their decision. Its success though in a way also had the somewhat unfortunate effect of obscuring the other songs they’d put out on Rhodes, including a solid effort called Toddlin’ Boogie. Ahh yes, the SONG! That’s what we’re here for after all, the music ON this record, whether you somehow heard it on Sensation 4, Vitacoustic 1004, or King 4238… or whether you heard it on the wonderful CD that collects all of this material, Blues For The Red Boy: The Early Sensation Recordings, or if you’re just hearing it now on Spotify or are waiting to buy it in the link near the bottom of the page below on iTunes for that matter. We haven’t had many piano-led instrumentals to date, only Forrest Sykes’ scalding Tonky Boogie back in March which sadly made no impact and disappeared quickly and Cecil Gant’s more rudimentary Hogan’s Alley qualify in that regard, which is somewhat surprising considering the instrument’s overall popularity still in all fields of music. Instead it’s been the saxophones that have dominated the field, and even on Toddlin’ Boogie that’s largely the case. But before we GET to the horns it starts out with the focus squarely on Rhodes hammering away on the ivories which is something that’s very welcome in the bigger picture of rock. We keep saying that in order for rock to make it and be a lasting genre of music that can pull in ensuing generations of listeners (which, spoiler alert, it winds up doing in case you were wondering!) it needs to avoid being defined too narrowly by sticking only to a small stylistic niche. After all if only one sound embodies the entire concept of rock then as soon as that sound becomes stale and loses its hold on its listeners then the entire genre won’t last long. The key to its success to date has been the fact that from the very start rock has been nothing if not diverse and it hasn’t just been one avenue that reaped commercial rewards but rather there’s been a sampling from each to crack the best sellers and most played lists which has given it the legs to be setting the pace in the musical sweepstakes as we speak. Right now it’s the instrumental that is at the forefront of that race and this of course is another track that is perfectly situated for the field and as it goes along and the horns start blowing up a storm there’s no question as to its potency. But the extended intro of Rhodes piano winds up being the identifying marker that sets this apart somewhat, making sure audiences will go on thinking of the piano as a vital rock instrument. When just around the corner we have a sudden influx of pianists on the scene we might not have time to remember that it was Rhodes who helped ensure they weren’t left out in its earliest days, so while we have a minute in this choppy review let’s make sure to give him the proper credit for his role in establishing the piano as a vital rock instrument. He plays it well here too, sounding like a few drops of rain (or snow back in January) falling before the suddenly skies open up without warning and it comes pouring down in a mad furious rush, his hands skittering across the keys with a vengeance setting a furious pace. Soon though Rhodes takes a back seat to the horns and that’s how we know for sure we’re squarely in the middle of the summer of 1948 again, where the saxophone was the king of the rock ‘n’ roll hill. They play with an impatient air following Rhodes lead-in before settling down mid-way through which has the unfortunate impact of easing the grip that assured our rapt attention and gives this a bit of an uneasy feeling all of a sudden, as if they all are beginning to get conflicted with their direction. Keep in mind there’s still a possibility that Rhodes and company will at some point, maybe not in this song per say but in the studio at a future date certainly, wind up returning to the jazzier sides he was also enamored with. At this point in Toddlin’ Boogie you can certainly see the dual instincts pulling at the group. Luckily though Rhodes had been primarily a club act up to this point (remember this was just his second session), someone whose job it was to keep the patrons happy rather than indulging in whatever made the musicians happy. That background playing in various Detroit clubs, working his way up the pecking order of bands in the city, each stop along the way bringing him more attention and thus more money and eventually more opportunities – such as recording – is what sets Rhodes apart from some studio cats who get paid the same whether they cut rock or jazz and thus they make no bones about what they’d rather do. Rhodes had gotten paid better the more noise they’d made with their music – rock in other words – and so you didn’t need to convince him which way to travel. He’d still cut some jazz sides but he was going to make his way with this music, loud, boisterous and unapologetic, because that’s what the crowds wanted to hear. To that end the horns get the spotlight to themselves from here on in, turning up the heat over the last minute, each one joining in and contributing something different – a repetitive siren-sounding groove to hold the bottom, a more indulgent solo that seems to wind its way up from the floor to the ceiling as they go along to get the people listening to let loose of their inhibitions, and a churning circular riff to pull it all back together again. Nothing particularly fancy or overly ambitious here, but it’s not really needed. Throughout all of this the drummer just keeps steady time, the bassist works off in the shadows barely noticed, while Rhodes chimes in with his piano from time to time to let you know he’s still around, but in truth what he’s doing is counting the number of people being pulled in off the street by this music and as he plays the fade he’s already figured out to the penny what it’ll be worth to him. A working musician to the end. So yeah, it took us awhile to get to it (the review itself as well as the record within that review) but I think it was ultimately worth the longer route. Leave a reply on "Todd Rhodes: “Toddlin’ Boogie”"